Photo used with permission from: Pierce County (Washington) Noxious Weed Control Board. Description: Tansy ragwart, Sencio jacobea, the plants stem stands straight up and branches out at the top. This plant is a biennial plant, it sprouts in late fall or early winter. The plant will live through the next year and after blooming and producing seeds it will die the following year. These plants get to about 6-feet high, with yellow colored flower petals numbering about 13 petals each. Roots: The plant’s roots start to spread from the crown of the plant, they are light in color and have a fibrous system structure. Leaves: The leaves of this plant usually are dark green on top, and a whitish green on the bottom. They appear ragged and ruffled with a deeply cut blunt toothed lobe. Stem: The stems grow one to six feet tall. Flower: The flowers of this weed are yellow in color, they have umbrella shaped clusters that occur at the top of a long stock. They have 13 petals in a group and they look like small yellow daises. Toxicity: The whole tansy ragwort plant is poisonous. The stems contain about 25 to 50 percent of the alkaloid found in the leaves, but the flowers contain about twice as much as the leaves. Tansy ragwort has six different pyrrolizidine alkaloids, which combine and add up in the liver of herbivores over time. When these materials are transferred into pyrroles, they cause liver damage. Intoxication often happens when small plants combined with desirable forage plants are ingested unknowingly by cattle and horses while grazing. After consuming 3 to 7 percent of their body weight of this noxious weed, animals may die. If they do not die, the milk produced by them could become toxic. Environments Favorable to Infestation: It can survive in most soil with moist conditions, and also if the temp. is hot, dry summers of the eastern part of the Pacific Northwest, and successfully survives in areas where temperatures can reach -20°F or lower if it has good snow cover. Impacts: This plant when eaten by live stock can cause liver cancer and eventual death. Once eaten by the organism the harmful materials and toxic milk stays in the organisms system and build up over time. The economic loss due to this plant is caused by the loss of money trying to control it and the loss of live stock due to ingesting the plant. Native Range/Entry to North America: Tansy ragwort originated in Europe. Tansy ragwort is a major problem in Oregon, Washington, and northern California. But, it was originally spotted by seaports in the early 1900's. The weed seeds were carried by straw and hay brought by hunters from infested areas west of the Cascades. Methods of Control/How to Prevent Spread: Biological control is the use of natural enemies that feed only on tansy ragwort. This method is effective in reducing plant population and is recommended for places where other methods controls are not economical. This process requires several years to establish an insect population big enough to reduce a weed population. The objective is not to destroy tansy ragwort but to reduce it to a level that is economically controllable. Three insects have been imported to eat tansy ragwort, these are the cinnabar moth, the ragwort seed fly, and the Tansy ragwort flea beetle. 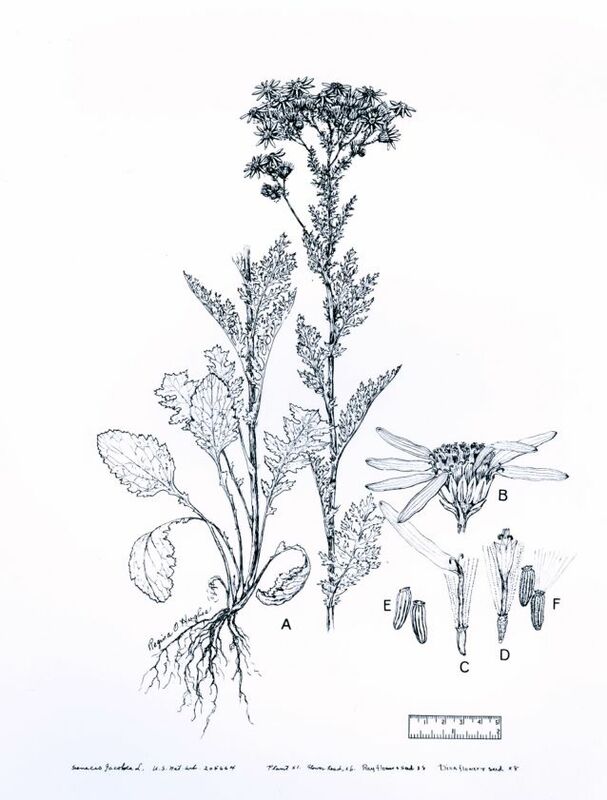 1) Natural Resources and Parks, Land and Water Resources Division: Tansy Ragwort Noxious Weed Identification, [Online] Available: Http://dnr.metrokc.gov/wlr/LANDS/Weeds/ragwort.htm, for questions please contact Jane Wentworth. 2) The Pierce County Noxious Weed Control Board, Tansy ragwort, [Online] Available: http://piercecountyweedboard.wsu.edu/Tansy.html, for questions call (253) 798-7263 weekdays between 7:30 am and 4 pm, 1/16/02. 3) The Washington State Noxious Weed Control Board, Tansy ragwort, [Online] Available: http://www.wa.gov/agr/weedboard/weed_info/tragwort.html, last updated on 7/11/01. 4) Made by L.C. Burrill, R.H. Callihan, R. Parker, E. Coombs, and H. Radtke, Forage Information Center, Tansy ragwort, [Online] Available: http://web.css.orst.edu/Topics/Pests/Weeds/Tansy/index.html, for any questions please send e-mail to webmaster@forages.css.orst.ede, last updated on July 30, 1997. 5) King County. Tansy Ragwort. http://dnr.metrokc.gov/Weeds/ragwort.htm November 23, 2005. By: Kip Becraft 3/2002. Updated by: Ben Wideman 2/21/06.